I don’t like Tommy on Broadway at all. I like the music, I’m pleased with Pete’s success but I don’t like what they’ve done to it. I don’t know many singers who actually do like the sound of their own voice. I don’t think there’s any way it could have failed. We don’t know failure in this band. We didn’t know failure. We got to know it a little after awhile but at that time there was no such word. My love for the band is still there. It hasn’t changed, maybe that’s why it’s so painful these days. I think if Keith Moon was here today and you asked him to recall most of his early life or most of his life, he wouldn’t be able to recall it. I think Pete did have a hard time as a kid with his appearance. But don’t all kids have a hard time? God, I had a hard time, too. I was little with bow legs and rickets. I used to get picked on like everybody used to get picked on. In those days I don’t’ think they were even demos. No, I was two years older than the other guys. I was a war baby. My family were a lot poorer than they were. I’d had to fight too hard for anything I had in my life and to smash things up for me. 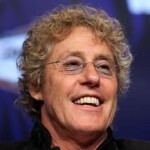 Roger Harry Daltrey is an English singer, musician, songwriter and actor, best known as the founder and lead singer of English rock band The Who. He has maintained a musical career as a solo artist and has also worked in the film industry, acting in films, theatre and television roles and also producing films.